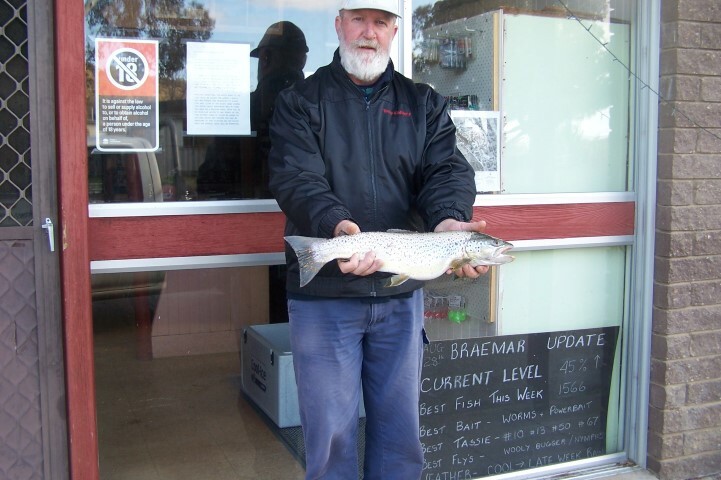 Peter at Braemar with a fishing report ending September 7th 2016. 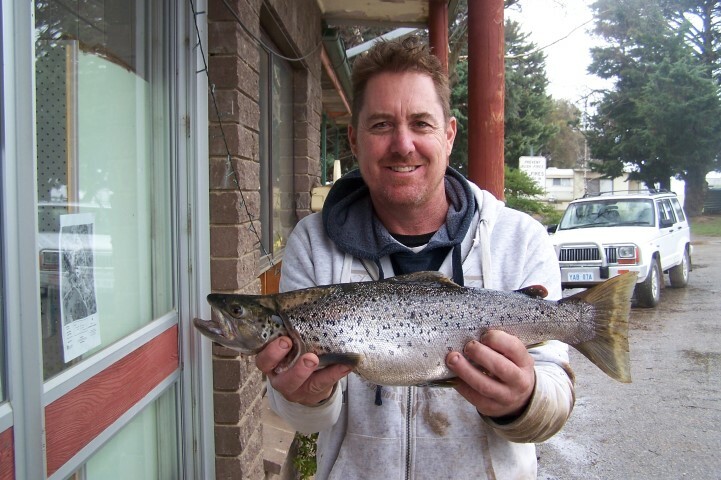 The fishing at Braemar improved dramatically over the past week with some great catches coming in on bait, lures and fly which is good to see, very heavy rain and some snow flurries kept everyone at bay for a couple of days but by the weekend conditions were suitable for all to get out and about. Once again the bait fishing proved most successful with several anglers getting amongst the fish with both Browns and Rainbows taking worms and powerbait without any fuss, Noel Brown and his son Tom from Melbourne have enjoyed some great sessions with Noel getting a 2056 gms Brown one day and Tom a 1994 gms Brown the next day, both were caught on worms, they have also had luck with powerbait catching Rainbows to around 800 gms. Daryl Suckley once again had a few good sessions down the front of the Park landing a very nice 1566 gms Brown on worms and his offsider Russell Banks landing a 1676 gms Brown also on worms, Peter Van De Burg and John Prentice from Queensland had one good morning session trolling in calm but very wet conditions and managed 3 Rainbows and One Brown to 1200 gms using a variety of Neptune Trout Minnows trolled at very slow speed, their fish were caught in Coppermine Bay in a 2 hour period in heavy rain. The 2 Perisher Ben’s led the fly fishing brigade using bead head woolly buggers and nymphs to land very nice Brown’s to around 2 kg, so things are looking up for the fly season, as the weather warms up a bit (hopefully) both Browns and Rainbows will actively cruise the edges late morning and early afternoons, so if conditions are calm its worth a shot at those cruising fish, even if there is no evidence of moving fish its sometimes surprising how many fish will be close in. 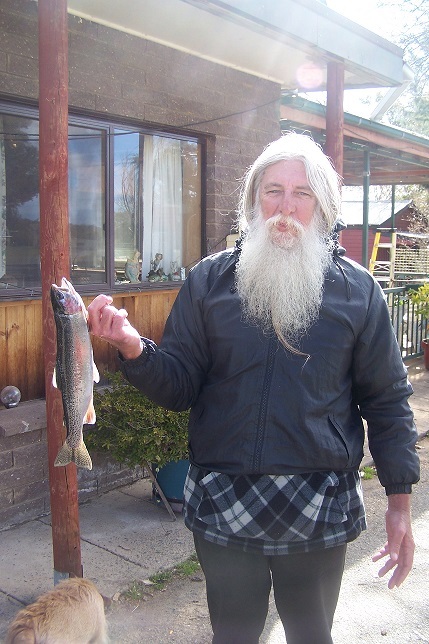 As always, we are happy to have visitors at Braemar but please call in at the shop on your way through so we know who is here and by all means report your catches or failures for recording purposes, the Lake is looking good and the fish are on the move for the time being so its the perfect time to book a short stay visit at reasonable rates for our cabins and houses. Pictured below is Noel Brown with his 2056 gms Brown, Daryl Suckley with his 1566 gms Brown and Russel Banks with his 1676 gms Brown.